Brewery: Brouwerij Van Steenberge N.V.
A deep ruby brown beer with an off-white lacy head and a sour, ironlike cherry aroma. Salty minerals and sweet-and-sour fruit on the palate, with a maltier note than some. There is a fruity, sour, and salty finish with late hints of grainy malt. This beer is apparently rare. I had no idea. I don’t even remember what it cost, but it was less than $10 for the bottle. I grabbed a bottle at Whole Foods. They have a solid selection, but sell just as many cases as they do single bottles. I think ALL beer should be available at ALL stores by the bottle. But that’s just me. I don’t remember the show, but when I search for “Monk’s Cafe” on Google, the restaurant from the hit TV show Seinfeld shows up. I wonder if that was the name of the restaurant on the show… anyone know? Anyway, let’s get busy drinking. In the Glass: I didn’t expect this to be so dark. It’s almost red. The label is red, which makes sense. But the last few sours I have had were not red. That’s for sure. But hey, I am fairly new to sours, so maybe THIS is normal. Nose: Holy cow. The first thing I smell is sour. Like SOUR sour. Not just sour… but sour sour. Did I mention this beer is a sour? I also am picking up some spices on the second sniff. After three or four smells, it starts to settle down a little bit. But I can already taste the sour. Let’s just see how sour she is. Flavor: The beer quickly slides across the palate, with little carbonation and then just disappears leaving your tongue with that almost too sour sour, but then a soothing finish. The back of the throat gets those spices I was picking up on the nose, but the sour doesn’t really last. That’s OK.
Mouthfeel: I wanted a few more bubbles, but the beer has a great mouthfeel. You don’t get much on the front of the tongue, but then the sour slides around and just punches you in the teeth when you start to swallow. Then the sour leaves, and those spices hang on into the aftertaste. The beer is also very thin, which I expected. As sour as it is, it is very easy to drink, and with a low ABV I could see myself throwing back a six-pack on a Friday night. 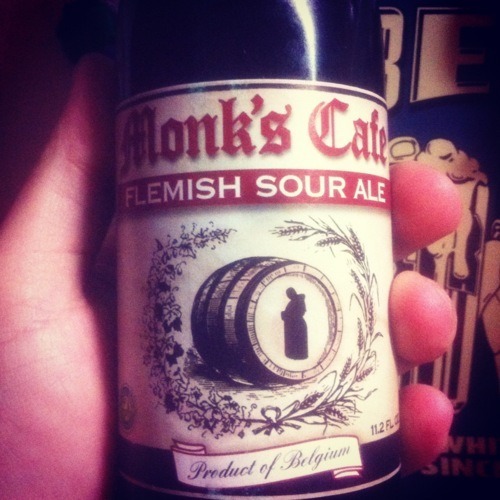 Aftertaste: The sour is so forward, it doesn’t really stick around. The spices that were on the nose do. The aftertaste lasts for three or four minutes, then you are left with a somewhat bitter, dry finish. The burp is pretty weak too, but the sour explosion on the tongue when you start drinking puts the rest to shame. This beer is rare, but shouldn’t be. It’s delicious. It’s also a good springtime beer too, as those sours make me think/feel about the summer just around the corner. I wonder what foods this would pair with… anyway, it’s great. Bottoms up, people! Hey, I’m back! I went to Seattle for about a week, so that is why Ricky and I haven’t done any beer reviews for a while. But now I’m back, and he wanted to do one today, so here we are. I actually brought us back some beers for 1001 Bottles from Seattle. There are a couple that I found that are from breweries there, so I figured why not get them while I could? I brought back a box (yes, a box – 4 beers) from Pike Brewing Company. I’m looking forward to having Ricky try them (I tried them while I was there, of course). Today’s beer poured out a dark ruby red color in the glass. It’s a little thick, but not too thick. Mine didn’t have a lot of head, but Ricky’s did. It’s a foamy white color. The beer smells really good. It’s kind of a sour, fruity smell with hints of bread and cinnamon. I know, how can you get all of those flavors out of smelling one beer? But there is just a lot of aroma going on here. I love it – I hope this beer tastes as good as it smells. This is a pretty good beer. I like the taste. It does taste a lot like it smells. You get sour, fruity carbonation on your tongue. It’s very drinkable. I could see this as a summer or fall beer. It’s light and fruity enough for summer, but the sour and cinnamon taste reminds me of fall. I could sit around a fire and drink this beer. It’s got a very different style to it, and I like that. Definitely one I would buy again. Good choice!